The final day of the 2016 World Series of Poker saw just three players return to the Rio All-Suite Hotel & Casino in Las Vegas to play for the main event title. The players had already locked up $3,453,035, but all three had their eyes locked on the $8,005,310 first-place prize. 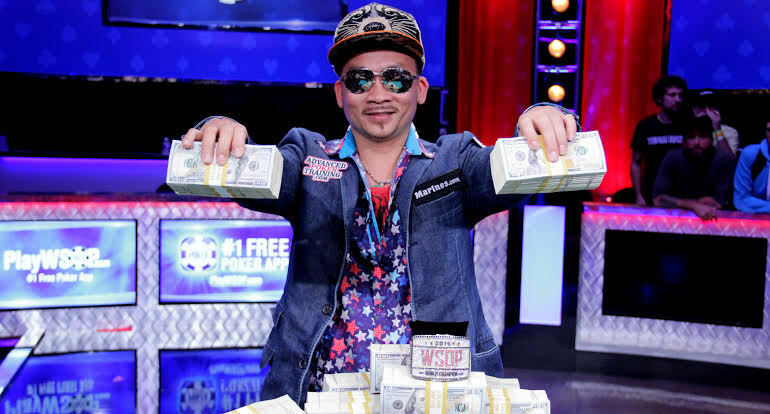 In the end, the title went to Qui Nguyen, a Vietnam-born, former nail salon owner who has lived in Las Vegas for the last nine years. The 39-year-old professional gambler had previous lifetime tournament earnings of just $52,896, but early Wednesday morning, he was crowned as this year’s world champion. Here’s a look at their stacks entering the final day. Although he spent the first two days of the final table taking a more serious approach, short stack Cliff Josephy had a much more lighthearted attitude on the final day of play. 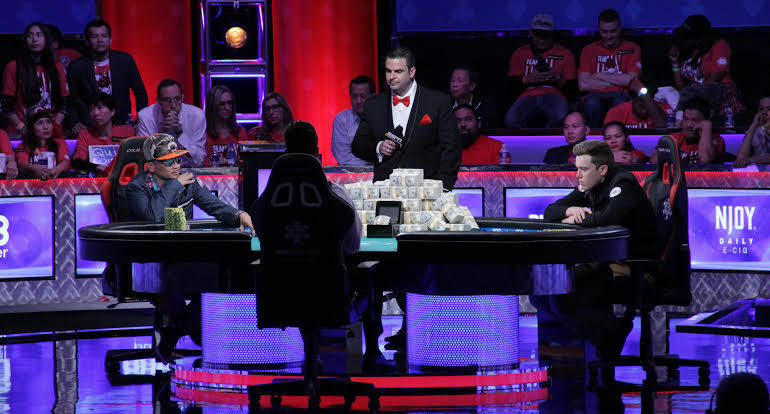 After donning sunglasses and a baseball cap, Josephy went right to work on the first hand of play by three-betting a button raise from Qui Nguyen. Nguyen four-bet and Josephy moved all-in. Nguyen called with A 4 , but was dominated by Josephy’s A Q . Josephy improved to a full house, and suddenly the stacks were a lot more evenly distributed. Unfortunately for Josephy, he didn’t hold onto those chips for very long. Just four hands later, Josephy and Gordon Vayo got involved in a monster pot where both players flopped a set and got it all in on the turn. Josephy, who had flopped a set of deuces, was left with just eight big blinds. Vayo, who had flopped a set of treys, vaulted from third to first on the leaderboard. Although Josephy managed to double up a couple of times through Nguyen, he ultimately went out a short while later when his Q 3 failed to catch up against the K 6 of Vayo. The 50-year-old bracelet winner earned $3,453,035 for his third-place finish, the largest score of his career. He now has nearly $6.1 million in career live tournament earnings. After taking out Josephy, Vayo was left with a chip lead of 200,300,000 to Nguyen’s 136,300,000. Nguyen won seven of the first nine heads-up pots, however, and was able to take a slight chip lead. Vayo battled back briefly, but Nguyen soon opened up a lead that he would maintain for almost the entirety of the heads-up match. The two would go onto play long for a very long time. It took 182 hands to get to heads-up play, and exactly 182 more to determine a winner. Finally, after numerous failed comeback attempts, Vayo made his last stand after Nguyen raised to 8,500,000 on the button. Vayo shoved for a total of 53,000,000 and Nguyen had no problem calling the rest with K 10 . Vayo was dominated with J 10 , but got a nice sweat on the flop of K 9 7 in the form of eight outs for a doubled-gutted straight draw. The turn and river, however, were the 2 and 3 , giving the pot and the title to Nguyen. Vayo took home $4,661,228 for his runner-up performance and was gracious in defeat, giving his opponent credit for playing well with a very unconventional style. Nguyen, emotionally and physically exhausted after nearly 20 total hours at the final table, looked dazed as he hugged his supporters and hoisted his custom bracelet. In addition to the cash, the bracelet and the title, Nguyen also earned 3,300 Card Player Player of the Year points, which by itself is enough to move him into 22nd place.